April 07, 1973, J. P. Pelham. 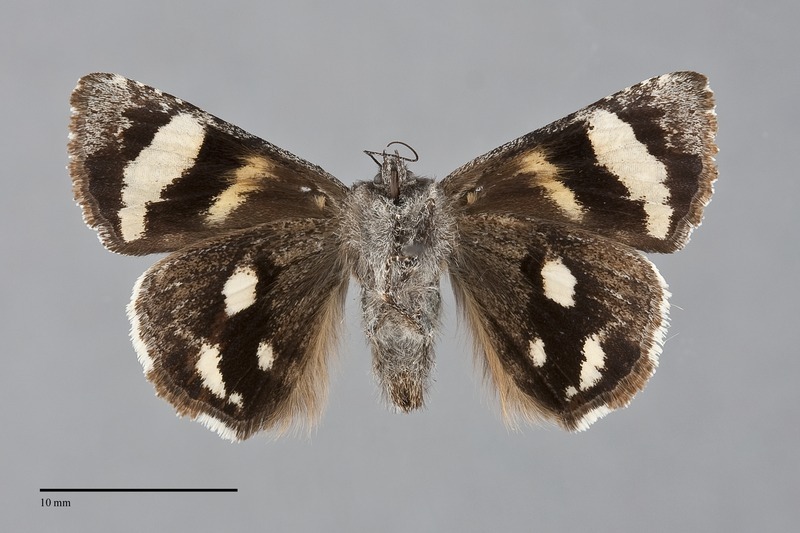 Litocala sexsignata is an unmistakable day-flying moth with yellow-spotted black hindwings. It is medium size (FW length 15 -16 mm) with broad wings. The forewings are dark blueish gray with a complex pattern of thin black lines and whitish gray between the reniform spot and a large loop of the postmedial line and in the median area abutting the antemedial line. The hindwing is jet black with three different-sized yellow spots and white fringe with a short black segment near the most lateral yellow spot. The entire body is gray. The antennae are simple in both sexes. This species is unmistakable due to its yellow-spotted hindwing. Larva is smooth, mottled brown with subdorsal scalloped dashes, and a ventral fringe of whisker-like hairs below the lateral line. It is illustrated by Miller & Hammond (2003). This species is widely distributed in oak woodlands and forests throughout western North America. In the Pacific Northwest, it is usually uncommon to rare, but occurs in oak woodlands and mixed hardwood forests with oaks at low elevations west of the Cascades, and in mixed hardwood-conifer forests at higher elevations in the Siskiyou and Cascade Mountains. This species is considered to be management sensitive, depending on oaks and chinquapin as larval foodplants. Litocala sexsignata is found in western Oregon in our region. It also occurs in a small area of Washington that includes the Columbia Gorge and the east slope of the Cascade Mountains as far north as Yakima County. This species is found from Montana and Washington to Colorado, Utah, and northern Baja California. This species is a foodplant specialist feeding on various Fagaceae. In the Pacific Northwest, it feeds on oaks (Quercus spp.) including both canyon live oak (Q. chrysolepis) and Oregon white oak (Q. garryana), and golden chinquapin (Castanopsis chrysophylla). 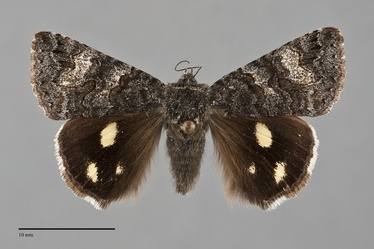 Litocala sexsignata is a diurnal moth found in early spring. Records in our region are from mid-March until early May. It sips moisture at puddles and has been found nectaring at willow catkins (Salix spp.) (John Davis, personal communication).